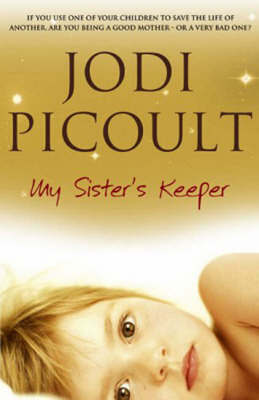 So, just to continue with my apparent ‘parents-who-make-terrible-medical-decisions-for-their-children’ phase, today we have My Sister’s Keeper by Jodi Picoult. See also my review of The Adoration of Jenna Fox here, while I try terribly hard to nip my growing obsession in the bud. Sara and Brian are devasted when they can’t find a donor for Kate, their little girl with leukemia. So, in desperation, they have a ‘designer’ baby – Anna, who is the perject genetic match for Kate. They plan to only use the blood from her umbilical cord, a procedure that will neither hurt or inconvenience her. But as Kate’s condition worsens, they need Anna to donate more and more. When Anna is thirteen, her parents assume that she will willingly donate a kidney to Kate. If she doesn’t, Kate will die. But Anna is fed up of feeling invisible next to Kate and sick of never being asked for consent. She goes to court to sue her parents for the right to her own body. I first read this in 2007, and it hurt me so much that I swore blind I would never, ever read it again. I both loved and despised it for the way it hurt and moved it me, but I just couldn’t bring myself to get rid of it. I’m not sure why I went back to it yesterday, but I’m glad I did. It’s a wonderful, wonderful book. The plot itself is very original – I’ve never read anything like it before. Family sagas, or whatever you want to call them, aren’t my usual kind of book, but Jodi Picoult’s books usually revolve around some kind of contraversial issue (designer babies and sacrificing one child to save another, in this case) and involve legal aspects and a court case, and the two combined more than sustain my interest. I pull Anna to her feet, one shoelace still untied. Dragging her out of the gymnasium, we reach the car before we say a word. Because your sister is more important than cake and ice cream; because I cannot do this for her; because I said so. I’m so angry that I have to try twice before I can unlock the van. ‘Stop acting like a five-year-old,’ I accuse, and then I remember that’s exactly what she is. As I said, I have read this book before, so the ending wasn’t such a shock. The first time though, I cried like a child. Not one slow tear rolling slowly down my face either – full on sobbing and dribbling (attractive, right?) . I never saw it coming and I don’t know anybody that did. What makes it so clever is the way Anna never comes off as selfish, not once. Even though you know and she knows that her lawsuit would indirectly result in her sister’s death, Ms Picoult makes sure you know that its not motivated by selfishness or a desperate bid for attention – its a genuine wish to have her opinions listened to. What she is doing to Kate breaks her heart, but she can’t go on being used as a walking organ suppository. On the other hand, you have her parents. Brian is unsure how he feels – he desperately wants Kate to recover, which means she needs a kidney; but he loves Anna equally and wants her opinion to be respected. Sara is adamant that Anna is just having a tantrum and constantly shouts at her to get a grip. At times she made me so angry, I’d have slapper her if she wasn’t so, well, fictional. The thing is, I do have a choice. Which is exactly why I have to be the one to do this. ‘I don’t think that,’ my mother interrupts. Despite this though, you never doubt that either of Anna’s parents genuinely love her. That’s the beauty of Jodi Picoult’s wonderful writing – you can really understand the conflicting emotions behind every character and see their confusion. They each seem so real, they’re never cardboard cut-outs with only one emotion. It was made into a film a year or two ago, so I’ll probably use this one for my Book to Movie Challenge. My only concern is that it stars Cameron Diaz as Sara, and she doesn’t look nearly old or haggard enough. But we’ll see. That’s my plan for this evening, I think. I actually thought Cameron Diaz did really well and I really liked the film. Abigail Breslin also was amazing, but i'm a big fan of hers. Not usually of Cameron Diaz though so that was a nice surprise! Yeah, you're right – Cameron Diaz actually did impress me, and I usually can't stand her! Wasn't fond of the film in general, but I thought she was pretty good.